How influential is your office design? Your office design is simply more than brick and mortar. Ultimately, it can be the basis for how your employees perceive and approach their jobs, both individually and en masse. By strategically positioning your workspace to both facilitate and resource the day-to-day tasks of Staff, plus integrating details to inspire positivity, your physical office becomes an effective business tool that supports premier performance and results. ‘Purpose’ provides meaning, driving us forward and sustaining us through challenges. ‘Purpose‘ is personal and different for each of us. Whether you are considering your personal, or professional purpose, connect with your staff by promoting the ‘why’ behind design decision. A set of purpose acts as an anchor, and constantly reinforcing the message is important to achieve your goals as a working community. What part does Purpose play? Matching your company’s purpose with your staffs’ life purpose keeps them engaged and productive. People experience brand, culture and purpose in the office as an integrated message. People identify a company’s purpose through the brand message it promotes which can be reinforced via workplace design. The secret to a successful workspace interior goes far beyond merely acquiring good real estate. Workspace is the convergence of your brand (which is also your culture) and your design theme motivated by your people. 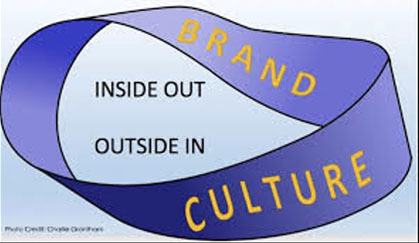 Your ‘brand’ is culture inside out, and conversely, ‘culture‘ is the ‘brand’ outside in—the two are inseparable. Every external brand messaging is a company’s culture in a broadcast. Conversely, these brand messages influence the company itself and are experienced as ‘culture‘. A great workplace empowers people and creates that connection to the organisation. Create social spaces inside the office to inject fun and play. Transform your ordinary places into social hubs where people can loosen up, feel at ease and interact. Bring in the murals and the quirky furniture. Integrating aspects such as a communal kitchen, or entertainment amenities like indoor slides, swings, ping pong tables all contribute to stimulating inner creativity in your workforce. FACT: Staff actively engages with their surroundings. So, offer focus points to enhance staff morale. Stimulate your team and break up the monotony of a bland office. Bring in the plants or mimic the grass and park benches. As noted by the Guardian, ‘extensive research at Exeter University concluded that employee productivity could be increased by 15% through the addition of plants to bare offices.’ Allow as much natural light as possible. Glass panels offering a nice view outside may also do the trick. Using office design to boost morale can have a big impact, for minimal investment. However, aiming to make your office look ‘nice‘ is not the end goal, and will not be enough. Your office transformation must be rooted from within to promote cooperation, productivity, and ultimately propel your business to success. Does your organisation need a workspace transformation, but you’re unsure where to begin? Speak with Wurkspace7.